Most Baltimoreans have heard of Dickeyville as "somewhere west of the city." 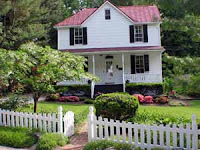 When you look at photos of the Victorian architecture, traditional old church, and white picket fences, it's easy to believe this historic neighborhood sits out in the country somewhere. The surprise is that Dickeyville is tucked into Baltimore City itself, snuggled up against the Gwynns Falls that meanders down to the Patapsco, the Inner Harbor, and eventually the Chesapeake Bay. Several mill towns grew up around Baltimore in the 18th century drawing mill workers and managers. Along the Gwynns Falls there were grist mills, paper mills, and woolen mills that provided cloth for both North and South during the Civil War. Towns grew up around the mills with stone houses, churches, schools, and shops. Through its history, the town took its name from leading citizens and businesses – first Franklinville for the Franklin Paper Mill, then Wetheredsville for the three brothers who expanded the town and converted the paper mill to woolen cloth. The they were enterprising, the war years of the mid-1800's destroyed their business, and Wethereds eventually sold 300 acres, three mills, and many of the houses to William Dickey in 1871. For several decades the town prospered and grew with new homes for workers, a church, and general store. But by the early 20th century the textile business had changed and work became scarce. The mills closed and Dickeyville declined into a shanty town with a seedy reputation. Finally, in 1934, Dickeyville's fortunes changed when much of the village was sold to a development company that began a restoration project. In one of Baltimore's first community preservation projects, old buildings were preserved as much as possible, and new homes had to blend in with the old. Many of the early field stone buildings were preserved, such as the three-story buildings of "stone row" as well as a church and schoolhouse. The vision of those developers led to the preservation of the town that is now a model historic village of homes and public buildings. In 1968 Dickeyville was added to the National Register of Historic Places, and it is a source of pride to its residents who maintain the town with care. People who live here treasure the park-like setting near the Gwynns Falls that creates an old village feel for Dickeyville that is unlike any other neighborhood in Baltimore City. I don't know if you remember me. 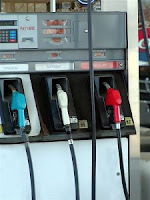 My name is Kaliq Simms, and about six months ago, we happened to be getting gas at the same station on Reisterstown Rd. 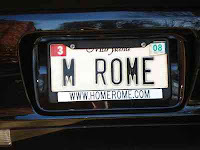 I recognized your name on your license plate. You had been the seller's realtor for a house we contemplated buying about six years ago when we were shopping for our current home. I was so impressed with your professionalism and great personality. We ended up buying another home (no fault of yours, of course), but I continued to visit your website periodically over the years, as I knew we would eventually want to sell our current starter home. Long story short, you gave me your number at the gas station that day and told me to call you when we decided to sell. Well, we've decided :)! I hope we can work together. We need a speedy and smooth sale because we have found the house we want to buy. We are already pre-qualified and have a realtor for the buy-side of this transaction. Please call us as soon as possible. Thank you! That Saturday I went on a listing appointment, and though they said they absolutely wanted to use me, they also said they wanted their attorney to look over the listing agreement. I told them, "Absolutely, and here is what he'll say: he'll tell you the commission is too high and the term is too long, and that you shouldn't sign it." While they were waiting to hear from the attorney, as a surprise for this delightful young family I put their home on my website with no address, no price, and a "Coming Soon!" heading. Later that week they reported that the lawyer said exactly what I predicted, but after thinking it over some more…they listed their home with me. Up went the listing on MLS, up went the listing on Active Rain, and we've had three showings already, one with good interest. I've always insisted on showing my own properties whenever possible. Six years ago, a showing that did not lead to a sale created an impression. 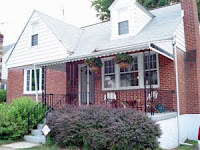 And today I have a listing for 7529 Rockridge Road, Pikesville, MD because of it. Mmmm…farm-fresh fruits and vegetables, succulent crab cakes, steak and cheese subs dripping with flavor, fresh from the Chesapeake crabs and oysters, fudge-topped cookies to satisfy any chocoholic. Hungry yet? 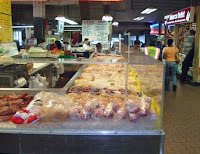 All these and more await you at Baltimore's Lexington Market, 225 years old and going strong. 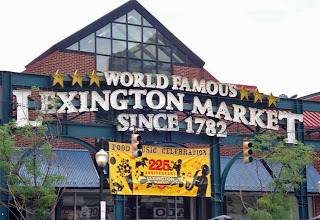 Opened in 1782, it is the world's largest continuously running market, and still at the original site on Lexington Street between Eutaw and Greene. At first, it was an open air market where farmers brought wagons filled with hams, butter, produce, eggs, and poultry. About 20 years later a shed went up and the market grew from there. Famous people have visited the market over the centuries; Ralph Waldo Emerson proclaimed Baltimore "the gastronomic capital of the world" after visiting The Market. The growth continued until there were more than 1,000 stalls and major traffic problems in the 1920's. Plans to replace old buildings with new, modern ones never quite got off the drawing board until 1949. In March that year a six-alarm fire destroyed buildings, equipment, and merchandise, and moved plans for a new market along quickly. Today, there are about 140 merchants carrying on the tradition. The Market hosts special events throughout the year including a Chocolate Festival, the Preakness Crab Derby, and Lunch With the Elephants when the circus comes to town. We just enjoy the every day guaranteed good eating, as you can see in the photos – that's Lee lining up for Andy's Steak subs. 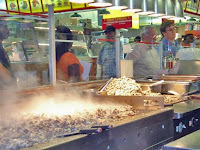 Lexington Market – a delicious Baltimore tradition not to be missed. 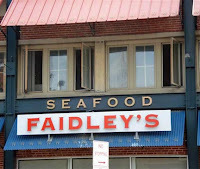 Be sure to try the fresh seafood – Faidley's is famous for their oysters. 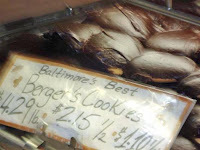 And don't pass the Bergers Cookies without buying a package or two. Chocoholics recognize them as the ultimate, with just enough cookie to hold a great glob of dark, rich, fudge icing. Bon appetit! 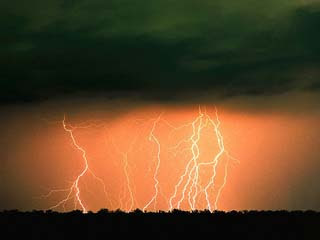 A True Type E Listing - Lightning Speed! Some days it just all comes together, and it feels soooo good! A couple of days ago I got a call from an agent who works at a retirement community in Florida. She was hoping to improve a situation for sellers who are moving into the community down there. This agent has always referred to someone else in the Baltimore area, but these sellers were not impressed by his service and lack of follow up - the house had already been on the market for 92 days. The agent in Florida found me on the internet, I think because of an article I wrote about Pikesville. That's right, by sharing information about my area I attracted attention from hundreds of miles away. Anyway, I told the Florida agent that I'm booked solid, but then learned that the agent has known these sellers for three years, that they've already bought and settled on their new home in a 55+ community called The Villages, just waiting to sell their home in Pikesville so they can resign their jobs and move on. I could imagine the pressure on the sellers, and so I called them just to touch base. Well, the phone call turned into a visit when the sellers and I connected in several ways. First, they are both RNs, and I talked about how I approach real estate as I did nursing. Find out what the "patient" needs, and make it better. The three of us agreed that we work for the satisfaction of how we continue to heal the situation. By the time the evening was over, I had a signed listing, and had measured and photographed the interior. It's just too bad they had a stager come in who made them remove a lot of their stuff and send it to storage…like the dining room furniture! Wonder what was he thinking? The next morning I was back for the outside photos, got the listing into the MLS, and sent the photos to my computer tech who put them up on the my website. The listing blog followed right after. Whew! I made up flyers and delivered them the next day – the sellers love the flyers, love seeing their house on the website, and love that they can google their address and the property comes up number one. I have to admit, I think it's pretty neat also. What was that second connection we found? Of course, one of the sellers is a Type E personality right up in the Mystic range. Guess I shouldn't be surprised that this might have been my fastest listing time ever from phone call to MLS. Hoping to make it a real record breaker by closing that circle with a contract soon! Stay tuned….